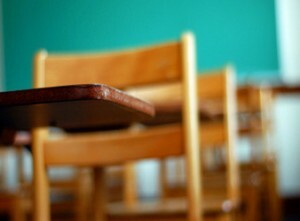 The local government in one eastern North Carolina county can’t be held responsible for “serious problems” with chronically underachieving local schools, a state appeals court ruled Tuesday. Responsibility for Halifax County’s lagging district falls instead on North Carolina’s state legislature and its executive branch, judges argued. That ruling comes after five students in the county and their parents or legal guardians accused Halifax County commissioners of unequal funding for the county’s three school districts, slighting two districts largely composed of minority students. It’s a pivotal ruling related to the state’s long-running Leandro case, which began in 1994 when plaintiffs in several low-wealth counties, including Halifax, argued students were not afforded the same chance to succeed as their peers in more affluent North Carolina counties. In the Leandro case, the court found the state has a constitutional obligation to provide a “sound basic education” to students. The plaintiffs in Tuesday’s ruling said decisions made by local county commissioners infringed on that right, although two out of three judges found that the local board of commissioners cannot be solely blamed for the districts’ myriad issues with facilities, supplies and performance listed in the case. “The court’s ruling in the Halifax case really tries to narrow the scope of the constitutional right to a sound basic education in a way that I don’t think the court that decided the Leandro case intended,” said Dorosin. Issues in Halifax’s minority-dominated districts include flagging test scores, deteriorating facilities and marked difficulty in hiring quality, experienced teachers—all in contrast with a third, primarily white local school district. Instead, the court found that responsibility rests with state leaders in the N.C. General Assembly and the executive branch, including Gov. Roy Cooper, the State Board of Education and the N.C. Department of Public Instruction. However, one dissenting judge, Chief Judge Linda McGee, wrote in her opinion that local governments have a “role to play” when it comes to the financial backing of the public schools. Because one judge dissented, the plaintiffs will have the right to appeal their case to the state Supreme Court. Dorosin said Tuesday he would be speaking to his clients in the coming days to discuss further appeal. Look for more on this pivotal case later this week from Policy Watch. This year’s $3.2 million cut is part of a two-year reduction for the state’s top education bureaucracy, which has been under withering scrutiny from Republican legislators in recent years. The agency had already weathered roughly $20 million in funding reductions since 2009. “I don’t think anybody’s going to like the cuts we make, because they’ll have to be in the area of services to the districts,” State Board of Education Chairman Bill Cobey said last week. DPI Superintendent Mark Johnson, a Republican elected last year, has been silent about the cuts thus far, although Cobey said the superintendent has shared multiple proposals for dishing out the cuts. Cobey noted the daily changes to those proposals last week. Board members are expected to vote on the cuts Tuesday. But a DPI official, citing the confidentiality of personnel information, said details on the cuts won’t be available to the public and the media until after Tuesday’s meeting. Watch for Policy Watch coverage of the cuts this week. A Sunday editorial from The News & Observer offers up some advice for Republican leaders in the N.C. General Assembly: Stop meddling with public schools. 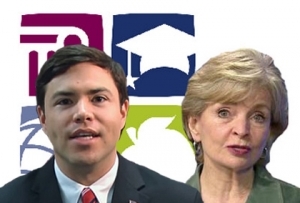 The editorial follows a report from Policy Watch last week on a budget directive from GOP lawmakers that eliminates top positions at the State Board of Education and the N.C. Department of Public Instruction, specifically targeting several with ties to former Democratic state Superintendent June Atkinson. The cuts also single out the top staffer for the state board, which is at odds with the legislature over the powers held by Superintendent Mark Johnson’s office. Gov. Roy Cooper vetoed the $23 billion Republican budget plan last week, but the GOP-controlled legislature overrode Cooper’s veto hours later. 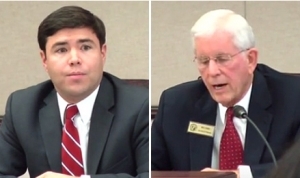 When Republican Mark Johnson, a 33-year-old former Forsyth County school board member, upset incumbent state Superintendent of Public Instruction June Atkinson, a Democrat, in the 2016 election, Republicans in the General Assembly were rubbing their hands together so hard they could have started a forest fire. In Johnson, who advocates for charter schools and expansion of a wrong-headed voucher program that takes money from public schools and gives it to parents to enable them to send their kids to private school, legislative leaders like Senate President pro-tem Phil Berger and House Speaker Tim Moore had an inexperienced superintendent to whom they could give marching orders. In the latest example of legislative meddling, a budget mandate reported by N.C. Policy Watch, a project of the N.C. Justice Center, would fire several education officials from the administration of Atkinson, and would eliminate a top staff member’s position with the State Board of Education, which by statute has charge of policy. Martez Hill is the board’s executive director. Johnson and the board, led by former U.S. Rep. Bill Cobey, a Republican and experienced public education advocate, have repeatedly clashed as Johnson, with the support of right-wing lawmakers, has tried to consolidate power. He’s doing so, of course, with direct input from Jones Street. No kidding. Johnson ought to be seeking and taking as much advice as he can from experienced hands like Cobey. The superintendent has a lot to learn. In fact, he has everything to learn, and he seems a lukewarm supporter of conventional or mainstream public schools, which isn’t good. And a weak superintendent gives full control of public education to the people who want it, the GOP leaders of the General Assembly. This kind of action also erodes confidence in the Department of Public Instruction, internally and externally. Republicans seem determined to dismantle the public education system that has served North Carolina well for over 100 years. In fact, it may be said that the state’s strong public schools transformed it, giving hope to millions of young people and opening their lives to the endless possibilities that education should inspire. Why GOP leaders want to meddle in and damage public schools remains a mystery, given that the majority of North Carolina families have their children in public schools. The State Board is hardly a liberal outpost, far from it. But it has provided needed supervision of Johnson, who has kept a low profile since taking office, perhaps on the orders of Berger and Moore. Who knows? What we do know is that these latest maneuvers are transparent, intended by lawmakers to weaken the state board and empower politicians with guidance of the schools. That’s not good. In addition to the position cuts, state lawmakers also ordered DPI to slash its operating budget by 6 percent, about $3.2 million, in the first year, followed by a 13.9 percent cut, or about $7.29 million, in the second year. It’s another round of cuts for a department that has seen its funding dramatically reduced under Republican leadership. 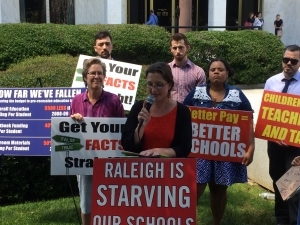 Protesters blasted the N.C. General Assembly’s K-12 budget Monday. 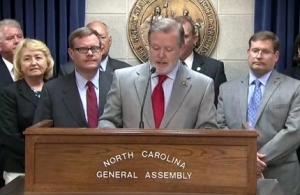 Despite modest increases in teacher pay and classroom funding bundled in the General Assembly’s now-approved budget, North Carolina public education spending still lags far behind pre-recession levels, advocates at the state’s legislative building argued Monday. “Even though our economy continues to recover, our public schools are facing a permanent recession caused by Republican lawmakers who would rather give tax cuts to millionaires and big corporations instead of investing in public education,” Logan Smith, communications director for liberal-leaning Progress NC Action, said. The advocacy organization touted new teacher pay numbers that show, when adjusted for inflation, pay at nearly every experience level lags pay in 2008, before a Wall Street collapse brought on a massive economic slowdown. Additionally, the group says, North Carolina spending, when adjusted for inflation, is $500 less per student today than it was in 2008. And state spending on textbooks, which received a non-recurring, $11.2 million bump in the final legislative budget, remains 40% less per student than 2008. Protesters said they planned to seek a meeting with N.C. House Speaker Tim Moore after their press conference to discuss the budget Monday. Later, Smith said Moore was not available when protesters visited, although they spoke briefly with some of the House speaker’s aides. “Clearly, he did not talk to any actual educators before writing this budget,” added Smith. Democratic Gov. Roy Cooper announced that he would veto the state legislature’s $23 billion spending package Monday, although the Republican-dominated legislature likely has enough votes to override Cooper’s veto. Meanwhile, veteran teachers blasted lawmakers’ approved pay raises in recent years, which as of the most recent national rankings, lifted the state’s average educator pay ranking from 41st nationally to 35th. Those numbers, however, did not include the pay raises approved by lawmakers this month, although teachers and other K-12 advocates say the legislature’s pay hikes won’t go far enough. They say experienced educators were left behind when lawmakers developed their salary scale. Amy Daaleman, a 25-year music teacher in Chapel Hill-Carrboro City Schools, said this year’s average 3.3% raise for teachers comes out to about another $30 per month for her. That’s not nearly enough to cover expected increases in health care premiums for teachers like Daaleman. Becky Campbell, a 22-year language arts teacher in Chapel Hill, agreed, pointing out last year’s much-touted GOP raises amounted to a $11.70 monthly increase in take-home pay for her. “I want the public to understand what a sham this support for public education is,” said Campbell. Teacher pay and textbook funding wasn’t the only gripe leveled at GOP state lawmakers Monday. Teachers and advocates also shredded lawmakers over the state’s looming class-size funding issue, teacher assistant funding and a state budget provision that eliminates retirement health benefits for new teachers beginning in 2021.